This report presents data on the nativity and parentage of the total population and the country of origin of the' foreign stock. These data were derived from answers to the questions on the Household Questionnaire shown in the next column. The information on place of birth is used to classify the population into two major groups: Native and foreign born. This category comprises persons born in the United States, the Commonwealth of Puerto Rico, or a possession of the United States. Also included in this category is the small number of persons who, although they were born in a foreign country or at sea, have at least one native American parent. Persons whose place of birth was not reported are assumed to be native unless their census report contains contradictory information, such as an entry of a language spoken prior to coming to the United States. The native population is further classified on the basis of the country of origin of parents into the two groups, native of native parentage and native of foreign or mixed parentage, described below. Information on place of birth of the native population is published in the 1960 report PC(2)-2A, State of Birth. This category comprises all persons not classified as native. Therefore, this group includes persons who reported a foreign country as their place of birth (with the exception stated above) and those persons with place of birth not reported who answered the question on language spoken prior to coming to the United States. The foreign-born population is combined with the native population of foreign or mixed parentage in a single category termed the "foreign stock." This category comprises all first and second generation Americans. Third and subsequent generations are described as "native of native parentage." Age data for the total foreign stock are presented in this report in table 14; all other data for the foreign stock are classified by nativity. In this report, persons of foreign stock are classified according to their country of origin, with separate distributions shown for the country of birth of the foreign born and the parents' country of birth for the native of foreign or mixed parentage. Native persons of foreign parentage whose parents were born in different countries are classified according to the country of birth of the father. 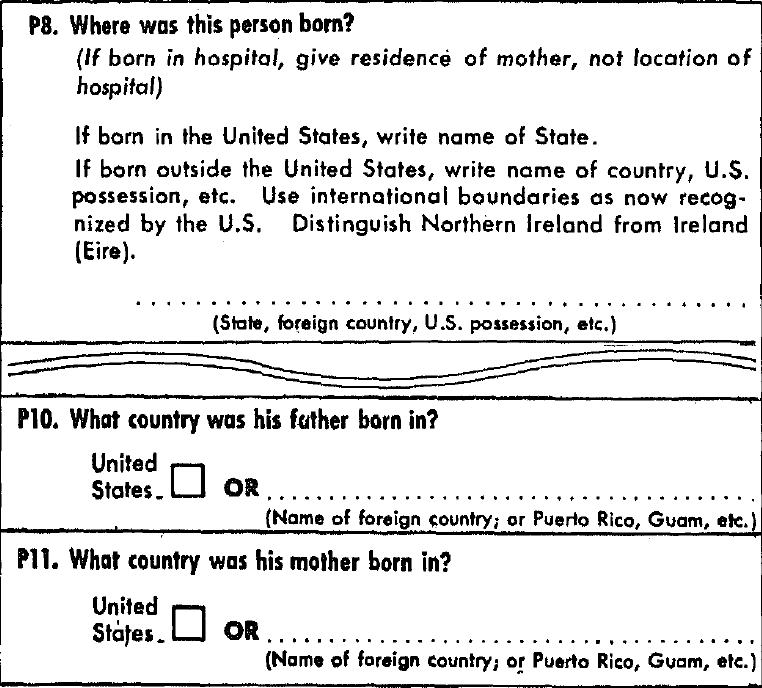 The question on place of birth and parents' birthplace specified that country of birth be reported according to international boundaries as recognized by the United States at the time of the census. (See excerpt from questionnaire above.) Because of the many changes in boundaries that have occurred over the past hundred years in the areas from which the major segment of the foreign stock _have emigrated, it is reasonable to expect that these instructions may not have been followed in all instances. Some misreporting of place of birth by persons ignorant of boundary changes, as well as by persons of illegal immigration status, most likely exists. Although no specific evidence can be cited for 1960, on the basis of data from the Post Enumeration Survey for 1950, it was estimated that the same country of- birth was obtained in the census and the survey for approximately 90 percent of the foreign-born persons properly included in the 1950 Census. 2Median age of the foreign-born white was 57.6; not available by country of origin. 5Excludes persons reported as of Ukrainian origin. In this century, nativity and parentage data have been available for the total population from the 1900 and 1960 Censuses only; for intervening censuses, tabulations were made for only the white population. In order to permit historical comparisons, a number of tables in this report are shown for both the total and the white population. Historically most of the immigrants to the United States were from European countries, and, therefore, only a small proportion of the immigrants were non-white. With the decline in immigration this situation has been changing, as is reflected in the increasing proportion of nonwhites in the foreign-born population (table C). The distinction between Canada-French and Canada- Other was not maintained in the collection and publication of 1960 data on country of origin. Data for 1960 for persons of Canadian origin are comparable with the sum of the categories Canada-Other and Canada-French from earlier censuses. Prior to 1950, questions on citizenship and mother tongue were used, when feasible, to assign entries on nativity and country of origin where these entries were omitted or uncodable. In the 1950 Census the question on mother tongue was excluded; in 1960, this question was asked of the foreign born, but citizenship was not asked. Data for 1960 on mother tongue are to be presented in the forthcoming report PC(2)-1E, Mother Tongue. The classification by country of origin appears to be consistent with the expected values based on an examination of past censuses. In countries where the same boundaries have been maintained over a long period of time, the classification by country of origin appears to be reasonable. The data seem to indicate that a completely accurate count of the foreign stock from areas in which there had been considerable boundary changes after World War I may not have been achieved. An example of such a problem is found in the reporting of Austria- Hungary as place of birth. A discussion of the technique designed to handle such entries is given above in the section on "Comparability of the data." Changes from 1940 to 1950 and from 1950 to 1960 in the foreign stock from Ireland (Eire), Northern Ireland, and, consequently, the United Kingdom seem to reflect errors in reporting rather than actual changes in the numbers in each category. Because of the omission from the schedule of any instruction to distinguish Northern Ireland and Ireland (Eire) in 1950, the number of persons of foreign stock from Northern Ireland was apparently underreported to a considerable degree in that census and that from Ireland, correspondingly overreported. The reinstated special caution relating to this point on the 1960 questionnaire resulted in a very different and probably more correct distribution between the two countries. The foreign born from Northern Ireland increased by 340 percent and those from Ireland decreased by 33 percent between 1950 and 1960. Similar changes occurred for native persons of Irish parentage. The decline in the foreign stock from the United Kingdom between 1950 and 1960 undoubtedly would have been greater had it not been affected by the spurious increase in the figure for Northern Ireland. The median is presented in connection with the data on age and years of school completed. It is the value which divides the distribution into two equal parts, one-half the cases falling below this value and one-half the cases exceeding this value. Median age for 1960 was computed on the basis of the 10-year age groups shown in .this report; for earlier years, medians are based on 5-year age groups published in previous reports. For 1960, the term "United States" when used without qualifications refers to the 50 States and the District of Columbia. In some tables, to preserve historical comparability, 1960 totals are shown for the 48 States and the District of Columbia, excluding Alaska and Hawaii. This area is designated "conterminous United States." For earlier censuses, this term refers to the expanding area of the United States (regardless of status as a State or territory) within the area of the 48 States and the District of Columbia. For 1960, the West and the Pacific Division include Alaska and Hawaii. These two States are not included in the areas designated as "conterminous West" and "conterminous Pacific." Metropolitan-nonmetropolitan residence refers to residence inside or outside standard metropolitan statistical areas (SMSA's). Except in New England, an SMSA is a county or group of contiguous counties which contains at least one city of 50,000 inhabitants or more, or "twin cities" with a combined population of at least 50,000. In addition to the county, or counties, containing such a city or cities, contiguous counties are included in an SMSA if, according to certain criteria, they are essentially metropolitan in character and are socially and economically integrated with the central city. In New England, SMSA's consist of towns and cities, rather than counties. Elementary school, as defined here, includes grades 1 to 8, and high school includes grades 9 to 12. College includes junior or community colleges, regular 4-year colleges, and graduate or professional schools. The category "less than 5 years" includes persons reporting "none" for years of school completed. This classification refers to the marital status of the person at the time of enumeration. Persons classified as "married" comprise, therefore, both those who have been married only once and those who remarried after having been widowed or divorced. Moreover, persons shown as married include those who are either legally separated or otherwise absent from their spouse because of marital discord. The enumerators were instructed to report persons in common-law marriages as married and persons whose only marriage had been annulled as single. Employed persons comprise all civilians years old and over who were either (a) "at work"-those who did any work for pay or profit, or worked without pay for 15 hours or more on a family farm or in a family business; or (b) were "with a job but not at work"-those who did not work and were not looking for work but had a job or business from which they were temporarily absent because of bad weather, industrial dispute, vacation, illness, or other personal reasons. The data on occupation in this report are for employed persons and refer to the job held during the week for which employment status was-reported. For persons employed at two or more jobs, the data refer to the job at which the person worked the greatest number of hours. The occupation statistics presented here are based on the detailed systems developed for the 1960 Census; see 1960 Census of Population, Classified Index of Occupations and Industries, U.S. Government Printing Office, Washington, D.C., 1960. White-collar workers include the following major occupation groups: Professional, technical, and kindred workers; managers, officials, and proprietors, except farm; clerical and kindred workers; and sales workers. Blue-collar workers include: Craftsmen, foremen, and kindred workers; operatives and kindred workers; service workers, including private household; and non- farm laborers. Farm workers include: Farmers and farm managers; farm laborers and farm foremen.